We hear and obey! It’s actually pretty tricky to make the sliding display remember where you were when you go back to it, but we have done this now. So from now on, when you are browsing from the sliding display and you click “Back” in your browser you will go back to the same place in the sliding display, We hope this helps! We’ve improved the method that the system uses to recognize alternate versions of your Wished-for books. That’s probably why you are getting more of these alerts: they go out to anyone wishing for a version of this book, whenever an alternate version of the title (different ISBN) is posted. They’re super ways to get the books you want when a version you didn’t know about comes into the system. But we know that some members want ONLY the versions of the books that are actually on their Wish List – so you can opt out of these alerts altogether, or for a specific title. If you do not wish to receive alerts about this title AT ALL, you should remove this title from your Wish List. If you are wishing for a specific version (ISBN) of a title, and do not wish to receive notifications about any other versions, you can opt out of these email alerts in your Account Settings. Just click the link in the email to do this, or see the Help doc “What’s in Settings in My Account?” for instructions on how to adjust your email settings. You can read more about “similar item” emails in several other Help docs in the Help Center. You can access the Help Center from the grey menu bar at the top of any page on the site. You sure can do this! This is another recent innovation on the site. If you want to block only similar-item alerts about one specific title only, you should click the link in the alert email to opt out of alerts for that title only. There is no way to do this from the account settings – that option is available only from the email. So you can wish just for the audio of this book and never get an alert about any other version. We’re so glad you like this new feature of the Wish List! We’ve had a number of reports of this happening, all in the first few days after the feature was made available. We hope it makes everyone’s wishes come true faster than ever before! Snazzy new items in the Kiosk….just you wait and see! Ming, the club is hopping with members who are glad to know you! You are our Member of the Month for November. Congratulations! If you have any nominations for Member of the Month, submit them to us here. Your nomination will not “expire”–anyone you nominate will have a chance at getting Member of the Month if enough nominations accumulate over time. Each month the person who has the most votes accumulated when the Newsletter goes to press gets to be Member of the Month and gets a newsletter mention and a nifty MoM icon to wear on profile and forum posts with pride. So go for it! Tell us who’s helped you in the Forums, who’s been a great swapper, who in your opinion is a credit to PBS. We are keeping a list of all the nominated members. Who knows–one of them might be YOU! If you want to be a Local Chapter Leader for PBS, you just need to have a PBS NIckname, a viewable public profile, and some organizational skills…check the Local Chapter Leaders Forum List of Official Chapters to see if your area already has a local Chapter. If not, and you want to do this, just contact us. There are no formal guidelines for being a Chapter Leader. All of the information is in the Local Chapter Leader Discussion Forum topic. If you are an official Chapter Leader and want us to include your upcoming meetup in the Newsletter, send in a message to us with the date, at least a week before the end of the preceding month. Thanksgiving Books… each one available to request right now! The Frugal Gourmet Cooks American Regional specialties: from native American Indians and colonists (including some recipes handed down from George Washington and Thomas Jefferson), from early settlers in Pennsylvania and New England; southern hospitality and the heart of soul food; recipes from the heartlands of America….all of this in one book! Over 350 recipes served up with a generous sprinkling of American history. And don’t miss these other books by the Frugal Gourmet! Thanksgiving When Megan Murphy discovers a floppy-eared rabbit gnawing on the hem of her skirt, she means to give its careless owner a piece of her mind, but Dr. Patrick Hunter is too attractive to stay mad at for long. As for Patrick, he wants nothing more than to play house with Maggie—and make Thanksgiving dinner for their families. But Megan has wept over one failed love, and she’s afraid to risk her heart again… A light-hearted romance by Janet Evanovich. 101 Thanksgiving Knock-Knocks, Jokes, and Riddles If April Showers Bring May flowers, what do May flowers bring? Pilgrims! Your kids will enjoy these jokes and riddles while the adults are in the kitchen cooking up a storm. Monkeys ..In this luminous story of family life, the seven Vincent children spend Thanksgiving with their father’s aging parents who come from a world of New England privilege. As they grow older, they meet with the perplexing lives of adults. Susan Minot writes with delicacy and a tremendous gift for the details that decorate domestic life, and when tragedy strikes she beautifully mines the children’s tenderness for each other, and their aching guardianship of what they have. A national bestseller. Can you expand upon that? Why yes, you can! We’ve made several more tweaks to the Wish List, to make it work even better to get books matched up with new readers. Since different publishers use different ISBNs to publish different versions of a book, there can be multiple listings for one book in the system. If you click on only ONE of those ISBNs you might miss out on a more commonly-posted version of the book (or even a currently-available one). The Wish Expander allows you to see ALL versions of the book that are known to our database at the time you are adding a book to your Wish List – you can browse all the versions, and add any or all to your Wish List quickly and easily. You can activate the Wish Expander under Options at the top of your WIsh LIst; after you do that, every time you click +Wish on a book listing you will be taken to the Wish Expander page. Other changes you’ll notice on the Wish List: we moved the Sort and Search to the top of the list to make them more convenient, and the auto-request setting is there too, so it can be applied to multiple items at once now. Read about all of the new Wish List changes here. Bookmarks on Demand. Those customizable bookmarks that you can download from the Spread the Word page are really popular! Note that you’ll need Adobe Acrobat Reader (free download here) to print the bookmarks. Don’t forget that each new account you refer will earn you another book credit. Read about eligibility requirements for referrals. And the winners are…. Every author interview in the PBS blog offers not only fascinating insights from the author but also a chance at a signed copy of the author’s book to anyone who comments on the blog! Bruce Boston was very generous and gave 4. The randomly-chosen blog commenters are Janet M. (BookwormMoucha), Jennifer C. (mrscasler), Carla G. (readragon) and Shondra W. (shoni). Congratulations! The goblins and ghosties are gone from the door, we’re pigging out on leftover candy and gearing up for winter…and here it comes, the holiday season! From Thanksgiving through the New Year, it’s a mad rush of family and feasting, decorating and cooking and shopping…we hope that you carve out some time to relax and enjoy a quiet read. Those of you who haven’t ordered the PBS Cookbook, now’s the time! There are all kinds of enticements – many member-submitted recipes that would be great for Thanksgiving, a picture of me in a chef’s hat (! ), and also you can’t miss the famous author recipes. Some of them are funny (Dave Barry‘s extremely challenging recipe for example), some of them are fanciful (David Anthony‘s Crunchy Dragonscale Delight), and most of them I can’t wait to try – Ken Follett ‘s Hot Dressed Vegetables on page 98 look easy and delicious. Hey, if anyone tries the recipe that I provided for the book, let me know how it turns out. It’s one of my time-tested favorites. You should get your order in now for the Cookbook before we run out! Thanksgiving can be a matter of cooking and feasting, then snoozing in front of the game on TV – and that’s all good! But I do try to keep the real meaning of the holiday in mind. Some of us may have less than we did last year; some of us may be doing okay but are still worried about the future. It is easy to focus on what we don’t have, and what is wrong. If each of us takes a quiet moment in the middle of the hubbub to close our eyes and finish this sentence: I am so lucky because… we might be surprised by what comes to mind. Let’s all join in acknowledging the bounty in each of our lives. To Enter: If you’ve tried one of the recipes from the cookbook already, let us know which one and how you liked it! If you don’t have a cookbook already, post one of your own favorite recipes. We will randomly pick a winner each day from ALL comments posted. So you only have to comment once to be eligible all week long. 1. The cookbook winner for day 1 (Nov. 17th) is Dana L. (daltonryan) -Congratulations Dana! 2. Day #2 (Nov. 18th) Winner is “T.” with the Pinto beans and cornbread recipe! 3. Day #3 (Nov. 19th) Winner is Debra H. with Crumb topped Blueberry Muffins! 4. Day #4 (Nov. 20th) The Winner is Marsha G. and her Briar Patch recipe! 5. Final Day #5 (Nov. 21st) Our Final Winner is June P. (JuneRose) with Cabbage & Noodles- Congratulations June! Congratulations once again to our winners! Thank you all for participating in the Great Cookbook Giveaway! 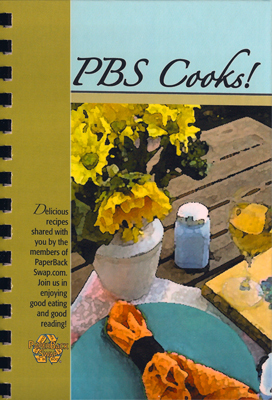 Be one of the lucky members to get the first edition of the PBS Cookbook! Over 200 pages of recipes submitted by PaperBackSwap members bound in linen-finish laminated hardcover with a comb binding. Authors: YOU. Edited by Sherry N. (royaltech). Assistant Editor: Elizabeth B. (Cattriona). Illustrator: Jeff & Carolee P.
Angela Hunt, Barbara Delinsky, Bertrice Small, Beverly Lewis, Carla Neggers, Charles David, Christopher Moore, Dave Barry, David Anthony, Diana Gabaldon, Elmer Kelton, Joy Nash, Judith Tarr, Julie Garwood, Karen Dinino, Ken Follett, Laura Fitzgerald, Linda Rosencrance, Linda Woods, Lisa See, Lisa Shearin, Margaret Atwood, Margaret Weis, Mindy Klasky, Philippa Gregory, and Rob Palmer! Want a small taste of the Author Recipes? Good Luck on the giveaway, but make sure to get your order in before we run out!